Ask The Bellwether: How can I match up color blocks when spinning space-dyed roving? How can I match up color blocks when spinning space-dyed roving? Split the roving lengthwise down the middle, keeping the halves the same thickness. Then, spin both halves the same thickness. Okay, I know, it's hard to split the roving and it's hard to spin consistent singles, but, you can come close this way. Sample cards help alot! If one color change is taking a while to happen on one bobbin, edit it out -- break off that single and move up to where you want the color to be. I like a little unevenness for heathering/marling between the color changes, but more than a few yards and I'm breaking my single, editing out a bit, and spit-joining the two ends of that single (or actually really joining them, if you can manage it) back together again. 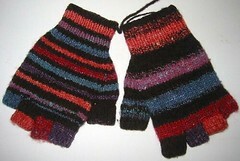 In the picture, the right glove (with the heathered color changes) was spun this way -- with editing! -- and the other was Navajo plied to keep colors separate. Fractal plying! This technique is described by Janel Laidman in the Summer 2007 Spin-Off; I've done it twice now, and love it. Split your roving in half lengthwise, spin one half onto one bobbin as-is, drafting-drafting, drafting. Take the other half and split it more -- I try to split it into at least 4 pieces lengthwise, then spin those lengths onto a second bobbin. When you ply the two bobbins, you get pleasing color changes where one ply changes more slowly than the other, leading to dominance of the color in the "slower" single -- it looks really cool, like subtle background striping, knit up. The picture shows handspun singles. I recently watched Patsy Zawitowski's video, "Spinning Textured Yarns". In it, she plies a space-dyed roving with its "perfect neutral". To do this, you take half the roving and blend together all the colors in the roving on your carder until they are all muddied up. Spin half as dyed, spin the other half from this "perfect neutral". It was cool - she showed how that looked, versus plying with other neutrals. I have also plied a space-dyed roving with white, which pales out the colors; black, which darkens them (and can brighten them); and brown, which adds a nice heathery/earthy tone. 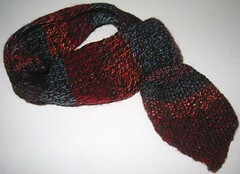 The picture shows a scarf from yarn where the colors were plied against a dark brown. Another thing you can do is break the space-dyed roving up into its separate colors, and spin and ply each color separately. Then, you can pick your color changes when you knit. The hat shown here shows what this could look like. How can I preserve color in a 2-ply? How can I preserve the color in my space-dyed roving when I spin it? How do you organize your spinning? Do you want to play with thread? Do you have suggestions on color handling in space-dyed roving, links to interesting samples of this, or questions on the topic? Please post a comment here or contact me. Thanks! Can you hear me laughing? Once again the question in my head was answered! I am spinning some silk, on my Natalie that I dyed and have bee wondering what the best way is to keep the colours distint. I have to tell you Ameila I think we are on a similar wavelength which is kind of nice considering we have never met and I am on the other side of the world! thanks again, vicki. Thanks for a fantastic post, Amelia. It's full of lots of good ideas to try! I especially like the idea of editing the allegedly matched singles (aka split roving). I've found that it starts off okay, but then gets increasingly out of whack. Removing the abberations is a brilliant idea!